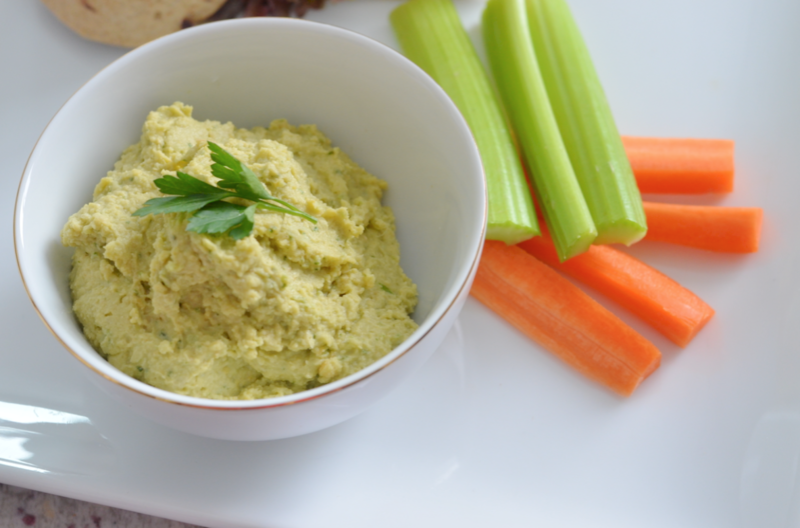 I LOVE hummus, its the perfect way to curb snacking (or even make it into a full lunch by adding it to a wrap) with something that is filling and satisfying. So when my friend Lisa said she was making me some hummus for lunch I was REALLY excited. I love this hummus, my husband and three-year-old also LOVE this hummus. Yes, it’s that good! So it comes as NO surprise that she did it again! The gorgeous Veggie Lisa has made me another dish (homemade hummus) that has officially ruined store-bought for me. Its good thing because this hummus is SO amazing and so NOT spicy (I actually hate spicy foods), but bad because now I have to start making my own hummus. So I’m literally shaking my fist at this recipe as I’m typing it out, for exactly both of those reasons. In food processor, combing cilantro peppers and garlic. Pulse until combined and finely chopped. In separate bowl stir together lemon juice, bean water. In another bowl stir together tahini and olive oil. Set both aside. Add chickpeas and lemon water mix to cilantro mix in food processor. Puree and scrape sides down as needed. Add salt, cumin and cayenne and slowly pour in tahini mixture. Puree again until smooth.